Eight shady figures find themselves stranded together during a snowstorm. Equal parts good, bad and downright ugly, this is Tarantino's blood soaked love letter to classic network TV and the down and dirty horror flicks of the '70s and '80s, more Sam Raimi than Sam Peckinpah. Tarantino has long been a disciple of Godard, and we've seen touches of the Swiss auteur increasingly creep into his recent work. 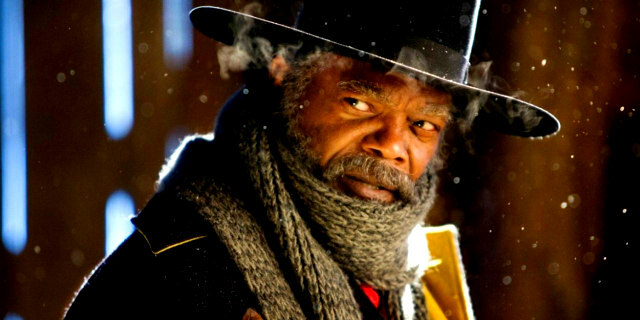 The Hateful Eight is Tarantino's most Godardian work yet, and like most of Godard's films, it's as insufferable as it is intoxicating, equal parts good, bad and downright ugly. 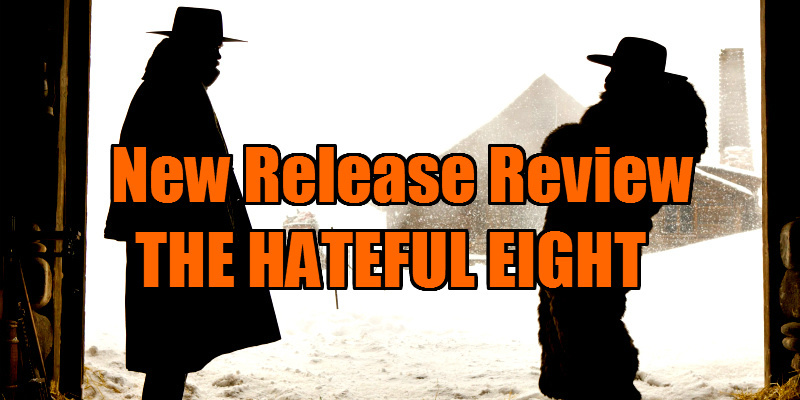 If we're to continue with this comparison, The Hateful Eight is Tarantino's King Lear. Just as Godard used the medium of of Shakespeare to launch a tirade against English literature and the limits of verbal communication, Tarantino shoots his western in 65mm (projected in an old school 'roadshow' presentation in the few remaining theatres capable of screening 70mm), only to confine the action to two claustrophobic sets. Don't expect any John Ford or John Sturges nods here; this is Tarantino's blood soaked love letter to classic network TV and the down and dirty horror flicks of the '70s and '80s, more Sam Raimi than Sam Peckinpah. The first batch of the octet we encounter consists of bounty hunter John 'The Hangman' Ruth (Kurt Russell) and his prisoner, Daisy Domergue (Jennifer Jason Leigh), who stop their stagecoach to take aboard fellow bounty hunter Major Marquis Warren (Samuel L Jackson) and Chris Mannix (Walton Goggins), the newly appointed Sheriff of the town they're headed for - Red Rock. To shelter from a blizzard, the party stops off at an outpost - Minnie's Haberdashery - where they meet English gent Oswaldo Mowbray (Tim Roth), a Mexican named Bob (Demian Bechir), cow puncher Joe Gage (Michael Madsen) and former Confederate General Sanford Smithers (Bruce Dern). As the snow falls outside, tensions rise in the haberdashery, eventually leading to bloodshed. As is often his wont, Tarantino splits his narrative into chapters. The first two involve the stagecoach trip, and make for a real endurance test, packed with the sort of irritatingly showy and overly verbose dialogue we've come to expect from a writer-director afforded a level of editorial freedom not seen since Kubrick. Things don't improve much at the haberdashery, with the third chapter ending with an immature monologue from Jackson that might thrill the teenage boys in the audience, but few else. It's at this point that Tarantino inserts an intermission, and it's as though he's daring cinema-goers to walk out in frustration. 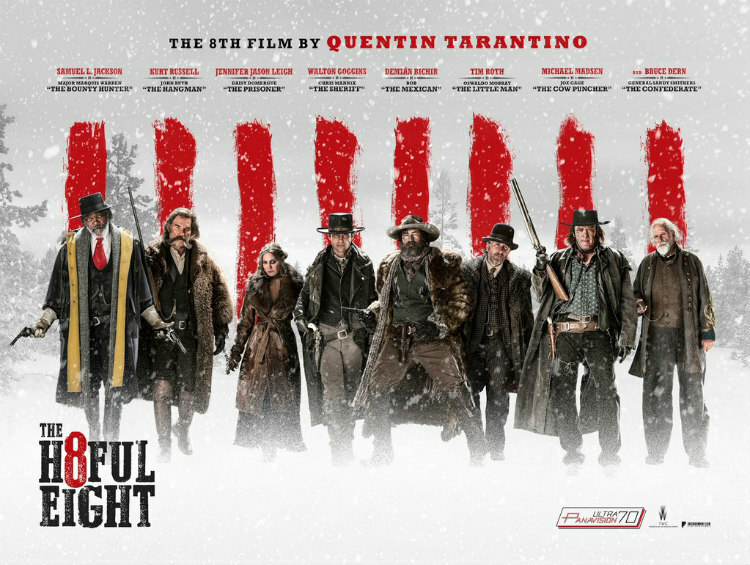 Stick around post-intermission though and you'll be rewarded with Tarantino's best work since Pulp Fiction. The self-indulgence continues with Tarantino himself appearing in voiceover to deconstruct his own narrative, flipping everything we've seen so far on its head. The rest of the movie plays like a grindhouse spam in a can horror movie, as blood spills and heads explode to riotous effect. References to TV shows abound, with Jackson's bounty hunter and Goggins' sheriff teaming up like Angela Lansbury and Tom Bosley to get to the bottom of the mystery, while a famous prop from sitcom Frasier plays a key role in the plot. There are signs of maturity from Tarantino here too. For the first time, his film features a score, composed here by Ennio Morricone, and employed like the scores of '60s TV shows, making an appearance at the opening of each chapter. It's the Italian's best work in a couple of decades and really burrows itself into your brain as the movie progresses. 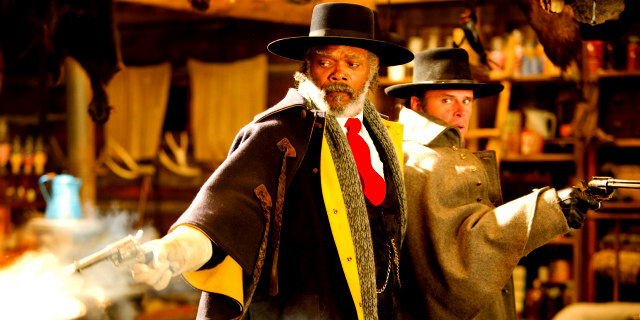 Like the film itself, Morricone's music owes more to '70s horror than classic westerns. Tarantino also indulges in some political commentary, and it's surprisingly gutsy and nuanced in its commentary on American racism. While Jackson finds himself assaulted with a barrage of racial slurs from the white cast members, it's revealed that he himself played a key role in the genocide of Native Americans, while later we learn a character with a dislike of Mexicans is herself black. You'd call it misanthropy were it not so grounded in truth. Sadly, Tarantino continues to 'borrow' music from other movies, an annoying trait that has the effect of at best pulling you out of the moment and at worst reminding you of how Tarantino so often relies on plagiarism. His use of music here is the worst of his career, with a White Stripes song plonked over what should be a melancholy moment of post violence, and a tune from the Last House on the Left soundtrack that was used chillingly in its original form but here just hangs awkwardly over a random moment. Much of the problem with recent Tarantino films has been the casting. Actors like Brad Pitt and Leonardo DiCaprio felt out of place in Tarantino's world, delivering hammy performances and struggling to sell his brand of dialogue. Here, everyone is on the same page, and it's a joy to see a Hollywood genre movie featuring actors over the age of 50. We're reminded of what great movie stars Russell and Leigh are, while Dern steals all his scenes while remaining seated for practically his entire performance. But this is Jackson's movie, and his best performance since Pulp Fiction; part John Shaft, part Deputy Gerrard, he prowls the limited set, chewing and spitting out scenery like tobaccy. The highlight of the film arrives when Tarantino imagines what might happen if Doris Day's Calamity Jane accidentally found herself in a spaghetti western, and the result is as hilarious as it is shocking. Whip crack away!